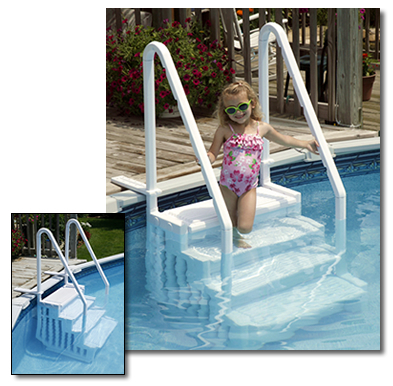 Step Dimensions = 10" x 27"
If your swimming pool does not have a deck and you need an outside ladder, we sell this above ground swimming pool step with ladder combination. The unit is easy to assemble and can accommodate up to a 350-lb. swimmer. The step is perforated to allow water and chemical circulation and eliminate a dead water area where algae can grow. The patented design allows for easy installation and removal of the ballast weight for off-season winterization. Easy Step’s top flanges anchor securely to any deck for a firm footing. Backed by a 3 year manufacturer prorated warranty. Invest in this in-pool step and make entering and leaving your pool a snap - at this great price!